Spring in the desert is the most beautiful time of year with the majority of plants in the landscape bursting out with flowers. It’s also a very busy time for me with landscape consultations, speaking engagements, work in the garden, and family life. I love to document the happenings in my life by taking photographs with my phone, and I’d like to share a sampling with you. It’s a fun combination that includes colorful plants, spiky pots, snakes, roses and the prom! No matter how busy I may be, the sight of a beautiful plant stops me in my tracks. It doesn’t matter how rushed I may be; I will always stop and take a photo. That’s what happened when I spotted this row of ‘Tangerine Beauty’ crossvines on our way into church. Even though we were running a few minutes late (as usual) I had to pause to admire the beauty of the lovely blooms and take a photo. ‘Tangerine Beauty’ does very well in the low desert garden. It has lush green foliage and orange/pink flowers that hummingbirds love. It needs a trellis or other support to climb up on and does well in full sun to filtered sun, but avoid planting along a west-facing wall as it may struggle in reflected sun. As I mentioned earlier, I do a lot of speaking on a variety of gardening topics at the Desert Botanical Garden, public libraries, and also to garden groups. Upon my arrival to give a presentation at the Paradise Valley Country Club, I was greeted by this beautiful bed filled geraniums, foxglove, and yellow daisies. The spiky shape of agave adds welcome texture contrast in this area. Across the way, I spotted this dramatic example of spiky succulents growing in pots. Agave are excellent container plants, and their spiky shapes look fabulous along this wall. The plantings underneath the wall are well chosen as they do well in areas with full sun and reflected heat. Back home, the rose garden is in full bloom with my favorite ‘Olivia Rose’ completely covered in fragrant, delicate pink color. She flowers more than every other rose in the garden and for the longest, ensuring her favored status. The best performing red rose in the garden is ‘Darcey Bussell,’ and she never disappoints as I view her vibrant blooms from my kitchen window. This rose is a relative newcomer to my rose garden. 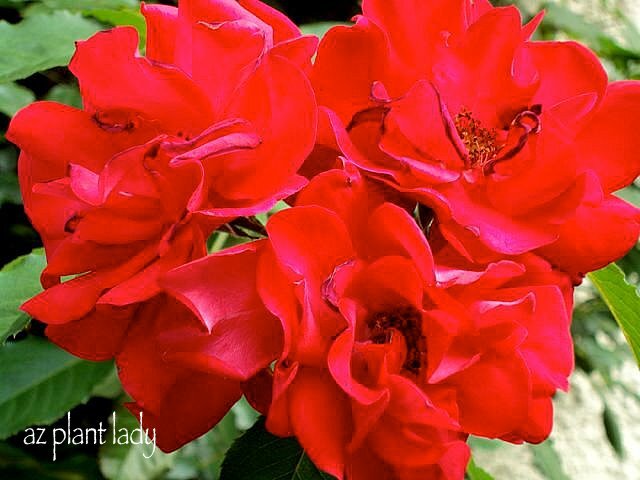 ‘Lady of Shalott’ was planted in the winter of 2018 and didn’t produce many blooms in her first year, which is typical of most new roses. However, this year, she is covered with roses in delicate shades of pink and peach. On the home front, spring means that it’s time for the prom. I can hardly believe that my son is old enough – it seemed like it was just yesterday when I came home with a darling little two-year-old boy from China. Kai’s favorite color is red, can you tell? It takes confidence to wear a bright color like this, and he does it so well. He is the youngest of four sisters, so this was my first time helping a boy get ready for a school dance. Honestly, it is a lot simpler – all he needed was help with his tie and his boutonniere. I love spring and all the busyness that comes with it. How about you? https://www.azplantlady.com/wp-content/uploads/2019/04/IMG_1313-001.jpg 1024 768 arizonaplantlady@gmail.com http://www.azplantlady.com/wp-content/uploads/2018/10/favicon.png arizonaplantlady@gmail.com2019-04-17 07:00:592019-04-16 20:08:34Colorful Plants, Spiky Pots, Snakes, Roses and the Prom! Have you ever noticed that spring has a way of surprising you in the garden? That is indeed the thought that I had earlier this week as I walked through my front landscape. After spending a week visiting my daughter in cold, wintery Michigan, I was anxious to return home and see what effects that a week of warm temperatures had done – I wasn’t disappointed. 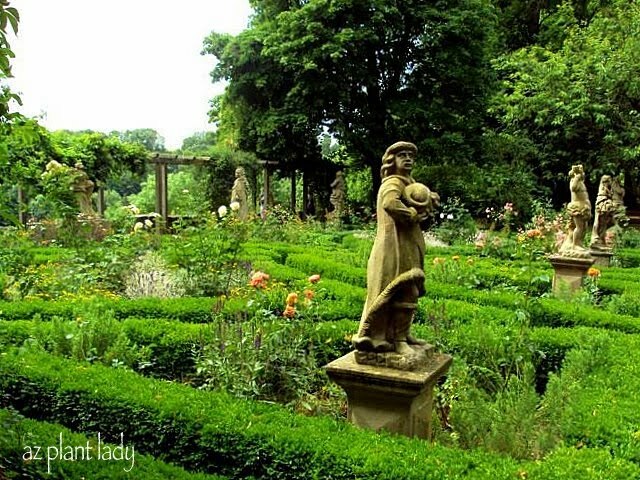 I want to take you on a tour of my spring garden. Are you ready? Penstemons play a large part in late winter and spring interest in the desert landscape, and I look forward to their flowering spikes. One of the most dramatic blooms that grace my front garden are those of my Echinopsis hybrid cactuses. I have a variety of different types, each with their flower color. This year, ‘Ember’ was the first one to flower and there are several more buds on it. Moving to the backyard, the gray-blue foliage of the shrubby germander is transformed by the electric blue shade of the flowers. This smaller shrub began blooming in the middle of winter and will through spring. This unique shrub was a purchase that I made several years ago at the Desert Botanical Garden‘s spring plant sale. If you are looking for unusual plants that aren’t often found at your local nursery, this is the place to go. This is a lush green, tropical shrub that is related to the more common Baja Fairy Duster. 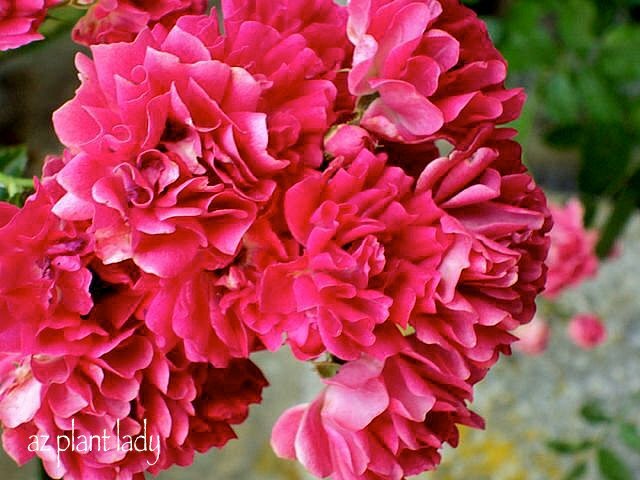 However, it only flowers in spring and has sizeable red puff-ball flowers. It does best in east-facing exposures. I am trialing a new self-watering hanging container that was sent to me free of charge by H20 Labor Saver for my honest review. I must say that I am very impressed. Growing plants in hanging containers is difficult in the desert garden as they dry out very quickly. But, this is a self-watering container, which has a reservoir that you fill, allowing me to have to water it much less often. In the container, I have Million Bells growing, which are like miniature petunias. They are cool-season annuals that grow fall, winter, and spring in the desert garden. Not all of my plants are flowering. My yellow bells shrubs have been pruned back severely, which I do every year, and are now growing again. This type of severe pruning keeps them lush and compact, and they will grow up to 6-feet tall within a few months. This past fall, my daughters took over the vegetable garden. I must admit that it was fun to watch them decide what to grow and guide them in learning how to grow vegetables. They are already enjoying the fruits of their labor and onions will soon be ready to be harvested. My Meyer lemon tree hasn’t performed very well for me and has produced very little fruit in the four years since I planted it. I realized that it wasn’t getting enough water, so I corrected that problem, and it is covered in blossoms – I am so excited! Moving to the side garden, chocolate flower adds delicious fragrance at the entry to my cut flower garden. 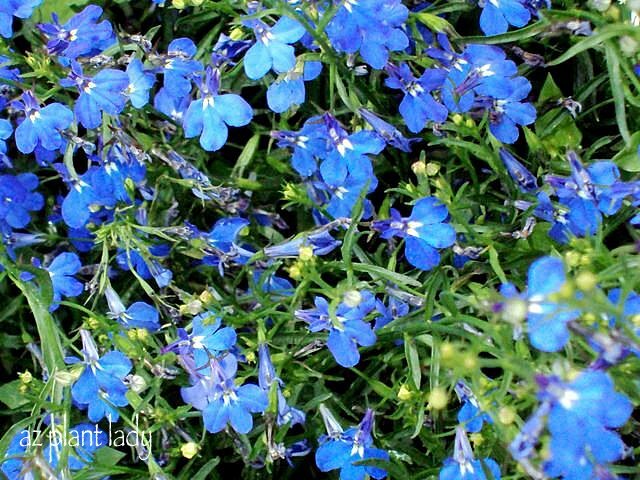 It does well in full sun and flowers off and on throughout the warm season. In the cut flower garden, my roses are growing back from their severe winter pruning. Although the roses aren’t in bloom yet, my California native verbena is. This is a plant that I bought at the Santa Barbara Botanical Garden – I don’t remember the exact name, but it does great in my garden. I have some fruit trees growing in the side garden including peaches! I can just imagine how delicious these will taste in May once they are ripe! While the peaches are already forming, my apple trees are a few weeks behind and are still flowering. It surprises people that you can grow apple trees in the desert garden and they will ripen in June – apple pie, anyone? I hope that you have enjoyed this tour of my spring garden. All of these plants are bringing me joy. 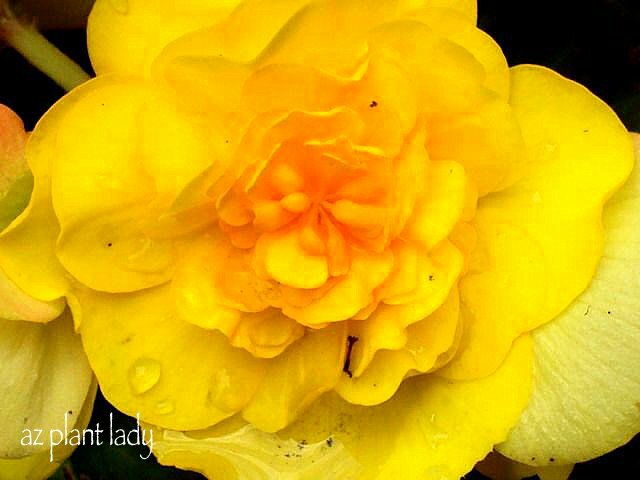 *What is growing in your garden this spring that brings you joy? UPDATE: This blog post originally was published six-years-ago, and I still like to grow vegetables in pots. It’s hard to believe that my garden helper is now 16 years old and driving a car! 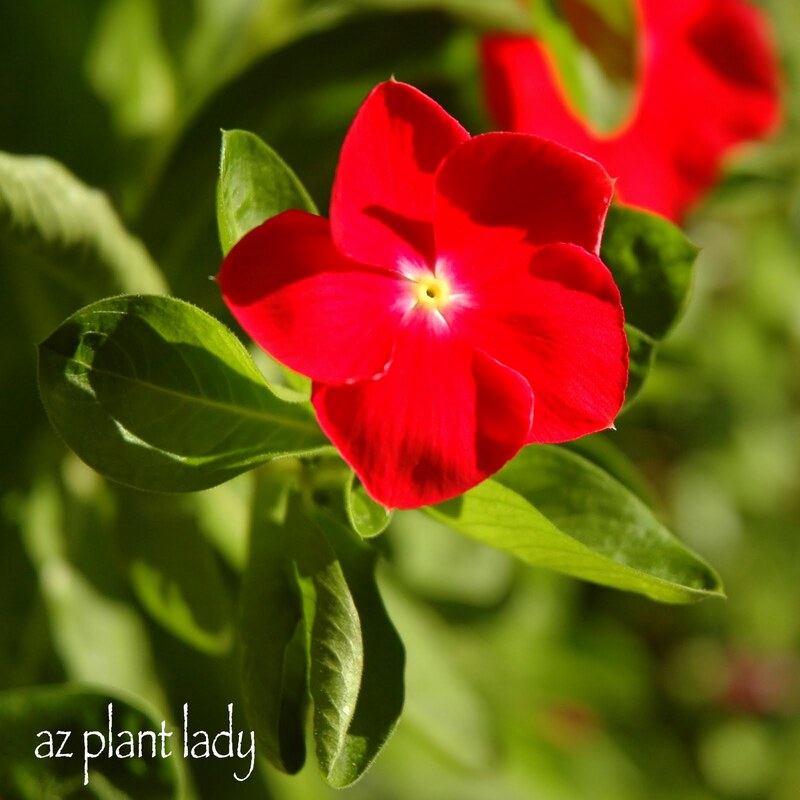 https://www.azplantlady.com/wp-content/uploads/2018/10/Lettuce-parsley-garlic-petunia-container.jpg 1200 1105 arizonaplantlady@gmail.com http://www.azplantlady.com/wp-content/uploads/2018/10/favicon.png arizonaplantlady@gmail.com2018-10-18 07:10:002018-10-17 12:27:56Grow Vegetables in Pots! Yesterday, I had a rather unexpected encounter with a javelina while taking pictures of a landscape. I think he was as surprised as I was to see him and he retreated back to his arroyo after a couple of minutes. That meeting inspired me to write this post and how they affect the desert garden – primarily what types of plants they like to eat. To state that I was surprised to come so close to a javelina is an understatement. In the over twenty years that I’ve worked in desert gardens, I seldom see these pig-like mammals as they usually sleep through the day underneath mesquite or other desert trees. Often referred to as ‘wild pigs’ due to their resemblance to a boar, they aren’t pigs, but are a peccary, which is a medium-sized mammal with hooves. Javelina are found throughout the Southwest, but their range also extends to Central and South America. In urban settings, you’ll find them in more naturalized areas. They frequently travel in herds, although I only saw these two adults on this day. While it can be enjoyable to view them from afar (don’t get too close as they can be dangerous), dealing with the damage that they cause to gardens isn’t fun. Javelina love to eat the pretty things we plant in our desert landscapes such as flowering annuals, and they don’t stop there. The spines on your prized cactus won’t deter a hungry javelina – they go right in and munch on the base of a prized columnar cactus as well as the pads of prickly pear cactus. When surveying the damage that they cause to the garden, what makes it worse, is that javelina frequently don’t eat what they dig up. My relationship with javelina is a long one, which began by working to keep them away from the thirty-six tee boxes that I had to plant with flowering annuals seasonally. Not surprisingly, they were drawn to these colorful islands and would dislodge the plants by rooting them up with their snouts before eating them. My crew and I had some mixed success with spraying squirrel repellent every few days on the petunias, but it was a lot of work and not foolproof. Javelina will zero in on popular potted annuals such as pansies, petunias, snapdragons, which are like candy to them. While geraniums aren’t their favorite potted flower, they will eat them too if hungry enough. 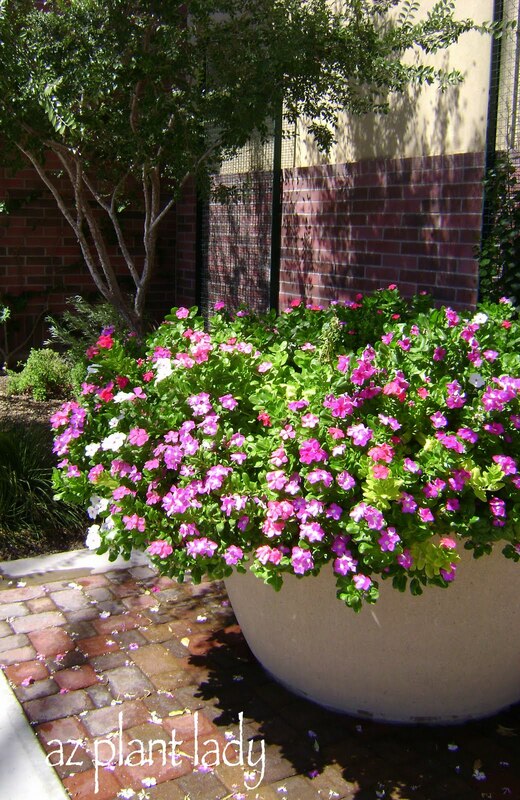 If you want pretty containers filled with flowers and live in a neighborhood where javelina are present, you’ll need to place the pots in an enclosed area or courtyard where they can’t reach. There are some flowering plants that they usually stay away from and these include Bacopa and Lavender, which can be used in containers. Depending on the time of year, a javelina’s diet changes, based on what is available. In winter, citrus they will grab citrus fruit off of the tree. In summer, mesquite seedpods are one of their favorite foods. A Cereus peruvianus cactus that has some bites taken out of its base by javelina. A fairly common sight is a columnar cactus with some bites taken out of its base, where javelina are present. In most cases, the damage is largely cosmetic and the cactus will be fine. However, to prevent further damage, you can surround the base of the cactus with a wire mesh cage. While there is no guarantee that javelina won’t eat the plants in your desert garden from time to time, there are some plants that are less palatable to them than others. Here a helpful link for javelina resistant plants, but I must tell you that if a javelina is hungry enough, it will eat the plants on this list – I know this from personal experience. The only foolproof way to keep them away from eating your plants is to keep them out with a fence or wall. Do you have javelina where you live? What type of plants do you notice them eating? Any plants that they seem to leave alone? Last winter, I was enjoying a rare moment of peace….no kids or husband in the house, the garden didn’t need any attention and no articles to write. So, I decided to see what was on television. As I was channel surfing, I saw a gardening show and of course, I stopped and watched. What I saw was the host and featured garden expert, showing how to grow vegetables and flowers together in containers. Since I love both vegetables and flowers, I was intrigued. So I bought the book written by the featured garden expert and got started. I found nice plastic containers on sale along with some tiny trellises, as well as planting mix (NOT potting soil, which gets too soggy for container plants). Planting mix is specially formulated for containers – it has a light texture and holds just the right amount of moisture for plants. The first container has purple violas, spinach, bell pepper plant and nasturtiums. I started all of these from transplants, except for the nasturtiums, which came from seed that I planted. I periodically snip the spinach for salads and I have harvested a single bell pepper so far. However, there are flowers on my pepper plant, so more peppers are on the way. This container was planted with red and green leaf lettuce, pink dianthus and cucumbers. I snip the lettuce for salad and the dianthus has been blooming nonstop. The only problem that I have had with this container are the cucumbers. Cucumbers do best when started from seed, not transplants. I have grown a lot of cucumbers over the years. So, I placed two small trellises in the back of the container and planted cucumber seeds at their base. I picked a variety of cucumbers that were small and would do well in a container. Unfortunately, they never came up. I tried planting them in my regular vegetable garden and they never came up. I tried starting them indoors and they didn’t sprout. *I had purchased the seeds online from a very reputable seed company, but the entire package of seeds was defective. So I planted my go-to cucumber seeds and they are starting to grow beautifully. My last vegetable/flower container has romaine lettuce, sugar snap peas and Icelandic poppies. The lettuce has done very well, BUT my little dog discovered that he likes lettuce, and he would take some little bites from the sides of the lettuce. I simply put some plastic patio chairs around the pot and he kept away. Later, I took the chairs away and he left the lettuce alone. The poppies haven’t bloomed yet, but I can see their buds, so it won’t be long now. I have been picking off sugar snap peas every time I am in the garden and eating them on the spot. So, does the idea of growing vegetables and flowers together appeal to you? The book I read was “Easy Container Combos: Vegetables and Flowers” by Pamela Crawford. (I haven’t been asked to promote her book – I bought it myself and really enjoyed it so much). **One thing I love so much about gardening is trying new things. This one was a home run for me. I absolutely love to travel and one of my favorite destinations is Europe. 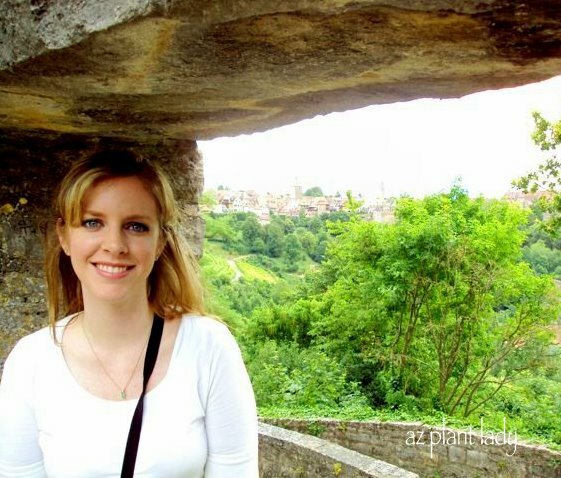 Unfortunately, I have not been able to visit in recent years, but my daughter and her husband were able to travel there this summer and visited three different countries – France, Germany and Italy. When they returned, I couldn’t wait to hear about their adventures and view their photos. I was particularly touched by the fact that my daughter took the time to take some pictures of some of the beautiful flowering plants they saw in Germany. 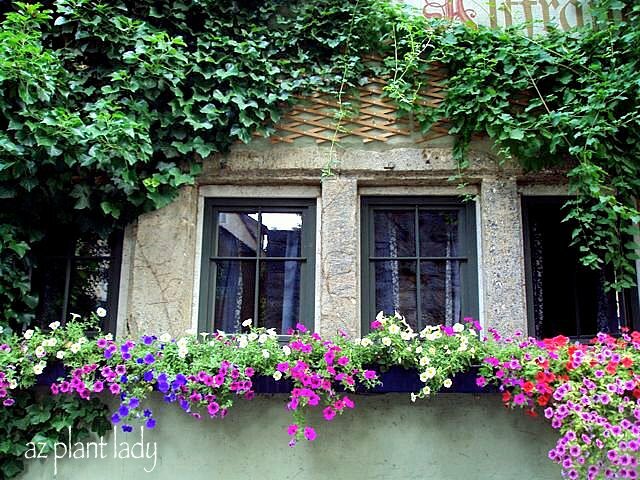 I just love window boxes….don’t you? The reason it meant a lot to me is that my oldest daughter is not particularly into gardening – but that could be because she lives in an apartment and has no space for gardening 😉 So, the fact that she took the time to take photos for me to share with me meant a lot. Don’t you love the stone planter? Germany has a special place in my heart because years ago, my grandparents were transferred there for work when I was young. 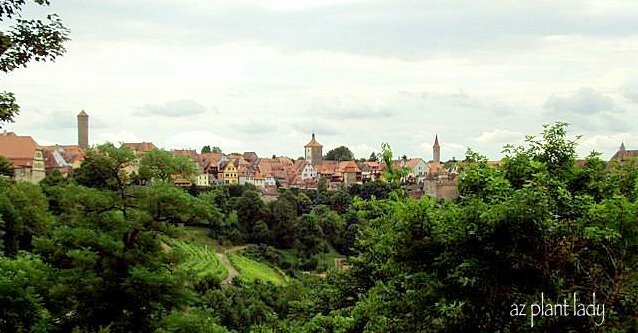 As a result, I spent two summers in Germany as a child along with my parents and siblings. We spent our time in Frankfurt where my grandparents lived. I remember the large field of strawberries that were grown in the back garden and the struggle keeping the rabbits away. But mostly, I remember how delicious the strawberries tasted. I grow this beautiful annual in the winter months. A couple of times a week, a local farmer would drive up our street and open up his van which contained a plentiful harvest of all sorts of fruit and vegetables. Wouldn’t it be great if the farmer delivered produce straight from the farm nowadays? 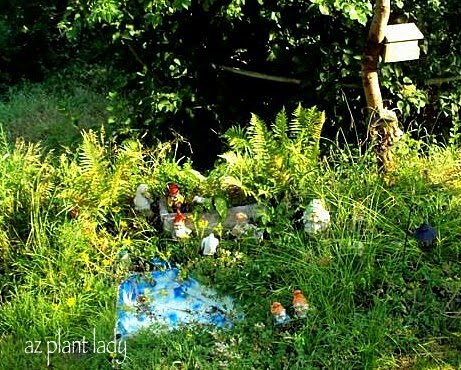 Okay, I just love this photo of little garden gnomes. I find it interesting how certain smells can bring a crystal clear memory to my mind. To this day, the smell of bus exhaust reminds me of a cobblestone street in downtown Frankfurt. These were my daughter’s favorite flower that she saw. Any ideas what type of flower this is? On my kitchen wall is the beautiful cuckoo clock that my grandparents brought back from Germany. Growing up, we loved hearing it cuckoo on the hour and dancing to the music that played afterward as the tiny figurines twirled in a circle. Isn’t this a beautiful flower? Our cuckoo clock has not worked for many years and I keep meaning to get it fixed so that my kids can enjoy it as I did as a child. Both my husband and I have some German ancestry and I hope to be able to visit there again and experience the beauty that Germany has to offer. Are there any places that have a special place in your heart for, or that you yearn to visit someday? One of my favorite summer annuals is vinca. Stop by any nursery this time of year, and you will find flats full of their vibrant blooms, and there are many different colors available. From purples and pinks to bright reds. 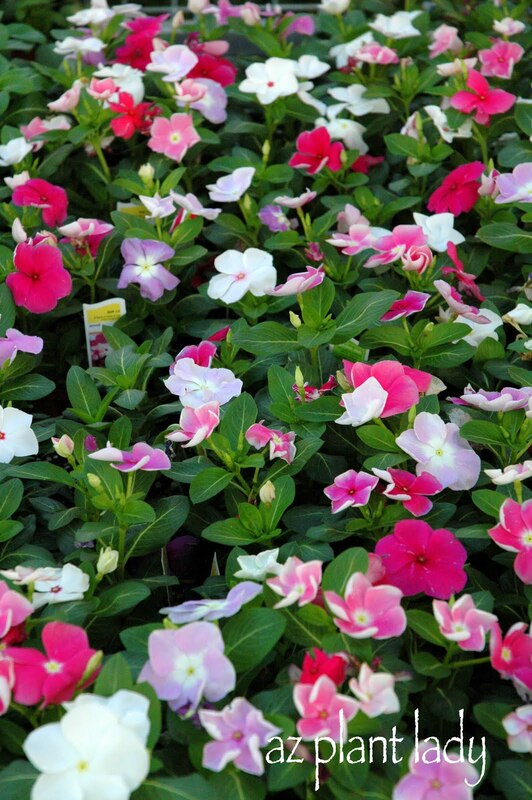 Vinca works excellent in containers or when planted in the ground. 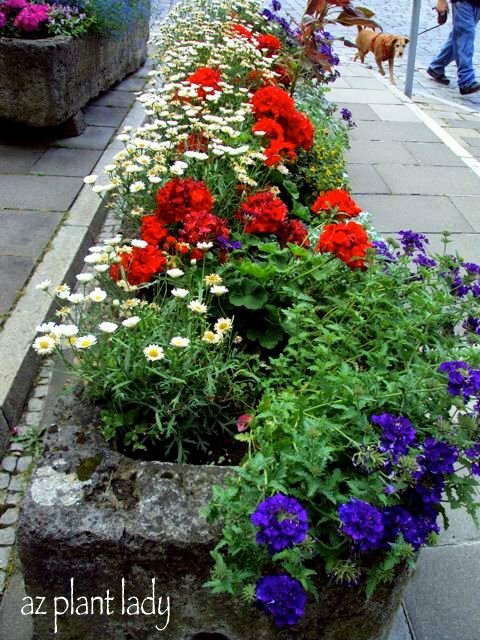 They prefer well-drained soil in a warm, sunny area. This warm-season annual enjoys regular watering and does best with some fertilizer, but don’t overdo it. I usually apply a slow-release fertilizer when planting and follow up with monthly applications of a liquid fertilizer such as Miracle-Gro. If you want to go organic, then you can just use a mixture of good potting soil mixed with compost. Now some of you may have had the experience of growing beautiful vinca one year and the next year; you have a terrible time with them. Shortly after planting you notice your vinca beginning to wilt, and no amount of water seems to help. Has this happened to you? 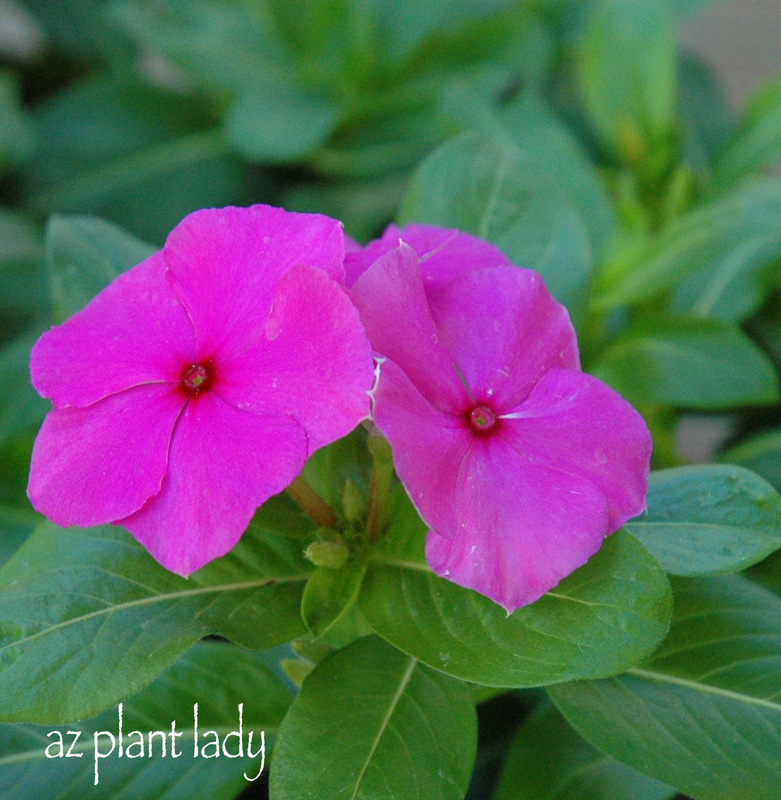 Extra water will not help because the vinca is suffering from a case of ‘Vinca Wilt’. This is not the scientific term, but for those of you who like long scientific names, your vinca is likely the victim of a Phytophthora fungus, which affects the roots, preventing them from absorbing water – hence the dried out look of the vinca. This fungus lives in the soil and infects the roots, causing them to rot. 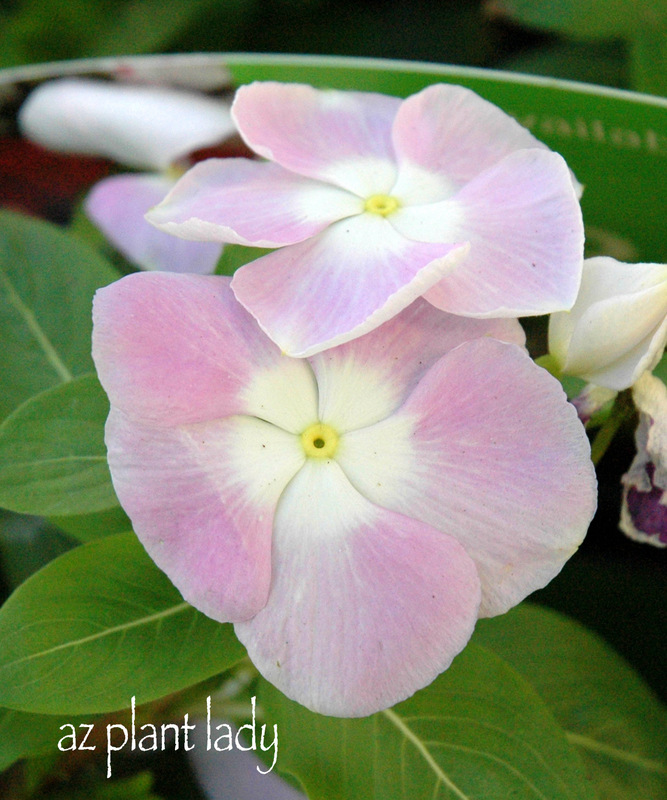 It loves moist conditions, and so more water hastens the demise of vinca. So, what can you do? The fungal spores can last for months or even years in the soil. You can usually rely on one good year of vinca growth, but then the spores start to multiply, and by the next year, they begin to affect your new plants. 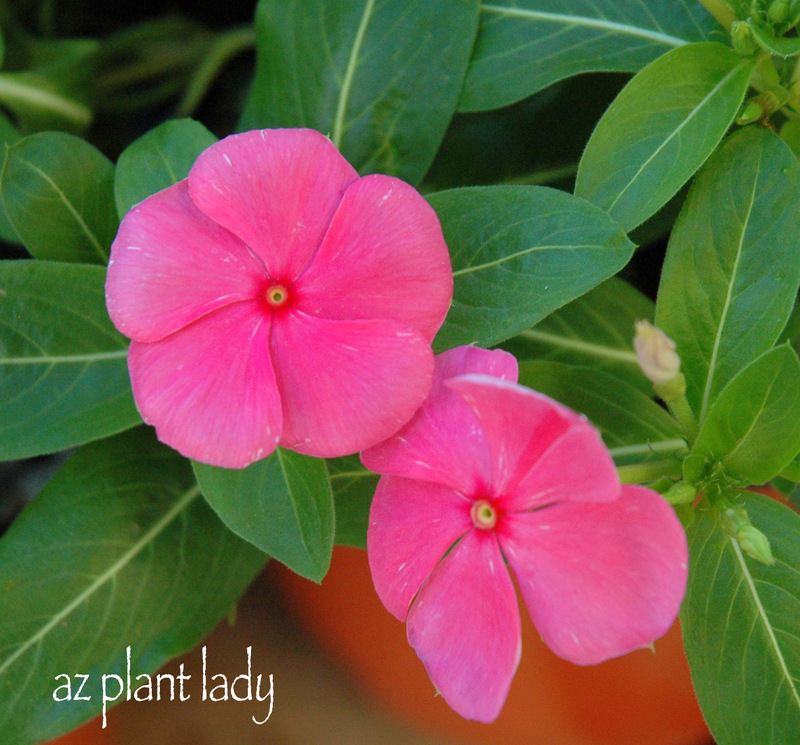 I recommend using vinca for one year and then use something different the next three years. Of course, you can remove all the soil from your containers and sterilize the inside with a bleach water mixture and then add new soil, which can work for a few containers at home, but it is not cost-effective in a larger setting. For me, it is not worth it either, because there are so many other beautiful summer annuals that you can use. I hope this solves any mystery surrounding vinca. They are beautiful and well worth growing – for a year at least. Today, I visited our local big box store to buy some summer annuals for my containers. Each time I visit, I mentally prepare myself ahead of time because I usually get frustrated at the fact that they frequently sell the wrong plants for the wrong time of year. I have posted about this before, which you can read here if you like. The following are flowers that were offered for sale today. Some are summer annuals for our area and some are winter annuals, which will soon die from the coming summer heat. Are you ready for the quiz? There are two possible answers for each question – summer or winter flower. How did you do? It is not easy to tell looking at the flowers which one will do well in summer and which ones do best in winter. I do go to big box stores and buy plants because they are usually inexpensive. BUT, I DO NOT rely on their advice or the fact that if they are carrying certain plants, that they are appropriate to plant at that time of year. Shopping at big box store nurseries only works if you do your research ahead of time. Just because they have a plant on display does not mean that it will survive for long in your garden. For example, the big box store had winter and summer annual flowers displayed right next to each other (above). There was no way to know that the one on the right would survive the summer and that the one on the left would soon be dead from the summer heat. If you are uncertain about what plants to purchase, then I recommend doing your own research OR going to a local nursery, where you may pay a little more, but you can receive expert advice on the right type of plant to plant the right time of year. I ended up buying two Radiation lantana for my front containers. Lantana are great summer flowers and I then transplant them into my garden in the fall. I want to share with you three amazing plants that I encountered on Saturday, each with pink flowers, yet each one so different from the other. I spent the afternoon at the Arboretum at Arizona State University (my alma mater). Many people are surprised to find out that they have a wonderful arboretum that encompasses the entire main campus. I had a wonderful time just walking around and taking pictures of beautiful trees and plants, my husband patiently trailing behind me with the kids. Queen’s Wreath is a beautiful vine that is native to Mexico and Central America. Stunning pink sprays of flowers appear in spring and last until the first frost. The most common variety has vibrant pink blossoms. However, there is a scarlet variety ‘Baja Red’ and also a rare white variety as well. Bees are attracted to the flowers, and the leaves are an attractive heart-shape. Queen’s Wreath can grow in full sun including areas of reflected heat. It will also grow in light shade although flowering will be reduced. This beautiful vine will die back at the first frost, but it’s roots are hardy to 20 degrees F. In the spring, it quickly grows back and requires a trellis, fence or an arbor for support. **When we bought our first home in Phoenix, there was support made up of twine tied between two Palm trees. We had no idea why, but it sure looked ugly. Well, before we had time to remove it, beautiful, light green, heart-shaped leaves began climbing up the twine support and quickly covered it. Then gorgeous sprays of pink flowers promptly followed, which was a pleasant surprise. The tree itself is relatively unremarkable. The flowers are not distinct. It is native to the tropical areas of Africa, parts of Southeast Asia and Australia. 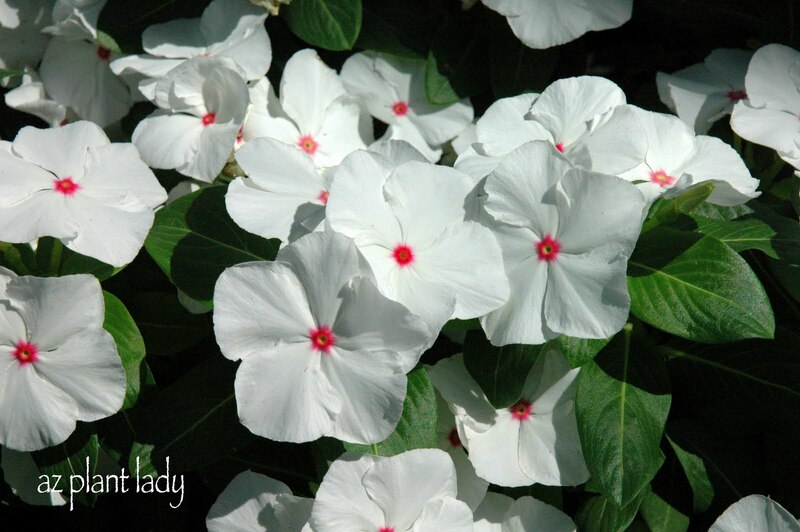 It grows well in full sun or filtered shade. In wet, tropical areas, it can be invasive. However, in our dry climate, that is not a problem. **Okay, I have to admit, that I had to look up information on this Chinese Lantern tree – I hate admitting that. I do not profess to know about every type of plant; this is easily evidenced by my travels to colder climates where I know about only a fraction of what the plants are there. But this one was in my backyard. I had never seen this type of tree before and had never learned about it either. So, I went through my countless dry climate plant books hoping to find what type of tree this was, and only one book had it listed, (which made me feel better). It is not common here in Arizona, but I guarantee that I will never forget it. Their trunk is covered with cone-shaped thorns. This beautiful tree does well in full sun or part shade. They do grow quite large, up to 40 ft. Wide and 50 ft. Tall. Silk Floss trees are native to Brazil and Argentina. **So, I was done for the day. I had two memory cards full of photos, sore feet, and a patient husband and kids, walking with me to the car. I was about to get in when I saw the Silk Floss tree next to the parking garage. So my husband, who knows me all too well, wordlessly unpacked the camera so I could take the last few photos. Occasionally see these trees around the Phoenix area, but rarely, so I was thrilled to get these pictures. I hoped you enjoyed my visions of pink. I will post more of my expedition at a later time. I’m pretty sure it will take me a long time to catalog all of the photos I took.